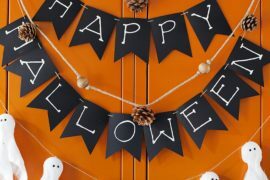 Decorating for Halloween can be a tricky thing, can’t it? 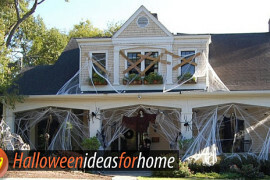 I mean, we’re so used to seeing the typical spider webs or skulls attached to things, and let’s face it – they can look cheesy, despite their awesome Halloween creepiness! 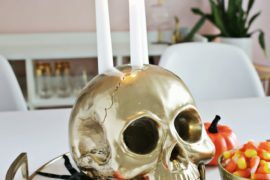 Halloween should be allowed to be chic, too! 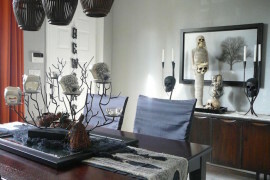 Well, I’m here to tell you that it can be creepy AND chic! 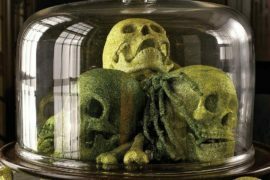 Now just imagine these little guys in your cocktails this Halloween! Or your kids stirring their hot chocolate with them, perhaps? Pretty cute, right? And the cost of making them is so minimal, you won’t feel bad tossing them out on November 1st. 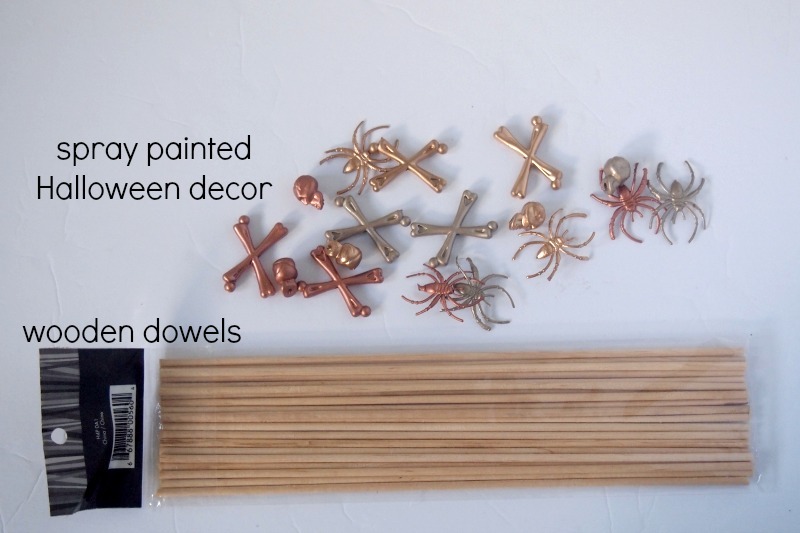 The first thing you’ll need to do is spray paint all of the spiders and skulls and bones. I used a champagne, a gold and a copper color to get a very on-trend mixed metals look. The stir sticks themselves are just wooden dowels! 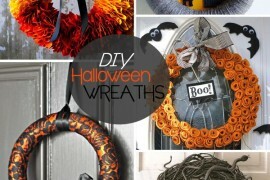 You’ll also need a hot glue gun for this. It’ll be handy to have an utility knife close by as well in case you need to cut the dowels down to a shorter size – as you can see, they’re pretty long! 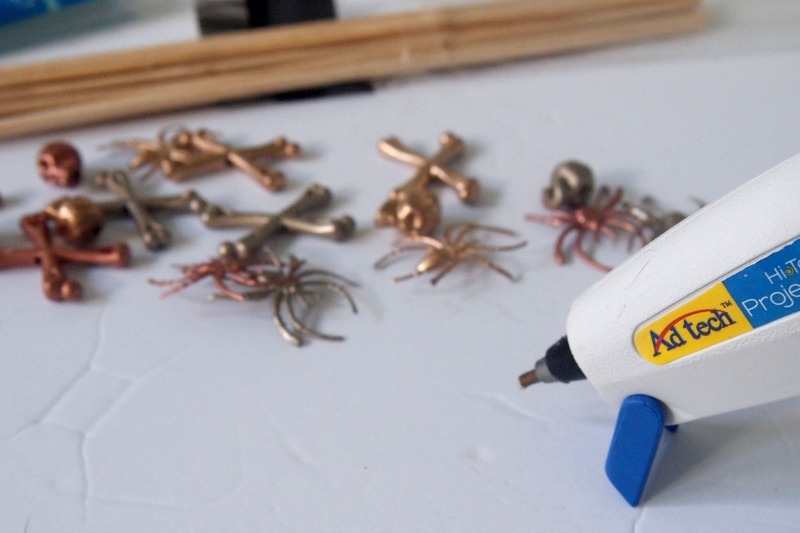 For the spiders, you need just a dot of glue on the back, then apply pressure for a few seconds onto the wooden dowel. 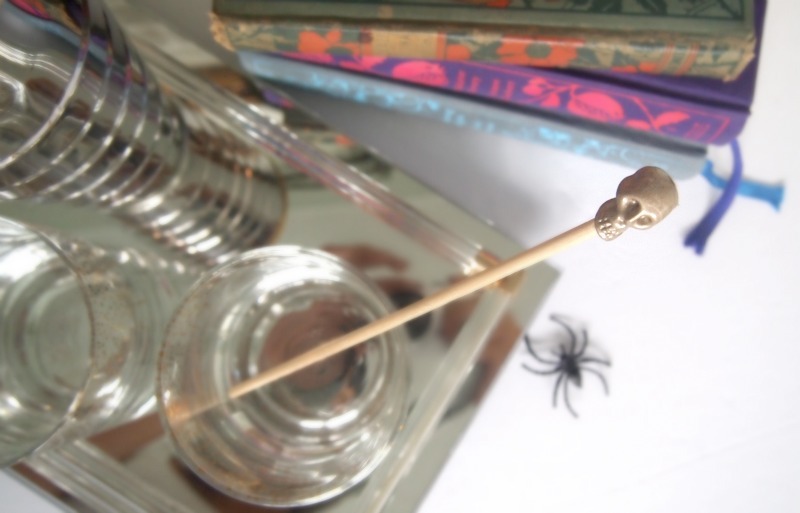 It really doesn’t get any simpler, and it’s definitely an option to stick to just spiders for a creepy-crawly look! 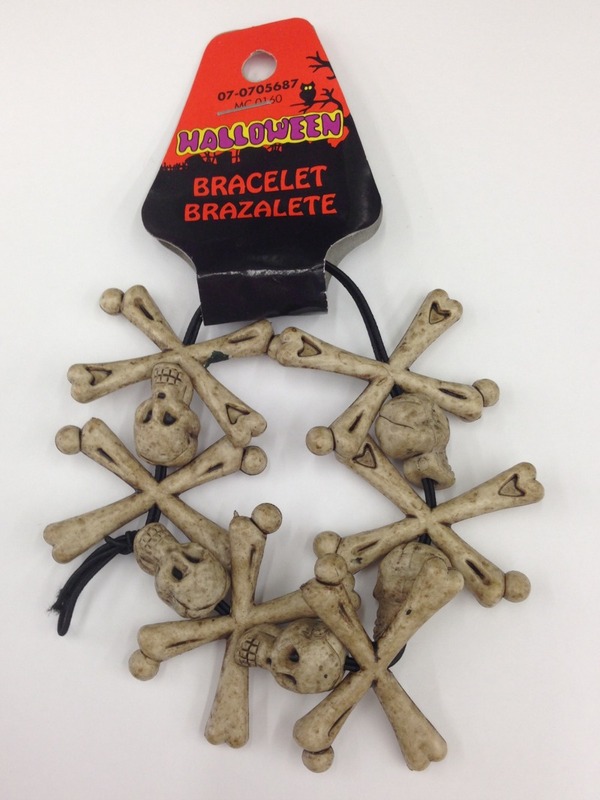 For the skulls and bones I took an extra step. Since they have holes on the top and bottom, I sharpened one end of the dowel so that it would fit into the hole with a bit of glue on it. I love this, despite the hole on the top of the skull and bones, because it doesn’t matter what angle you look at the stir stick from. It all goes together so well! At this point, you’re basically done! 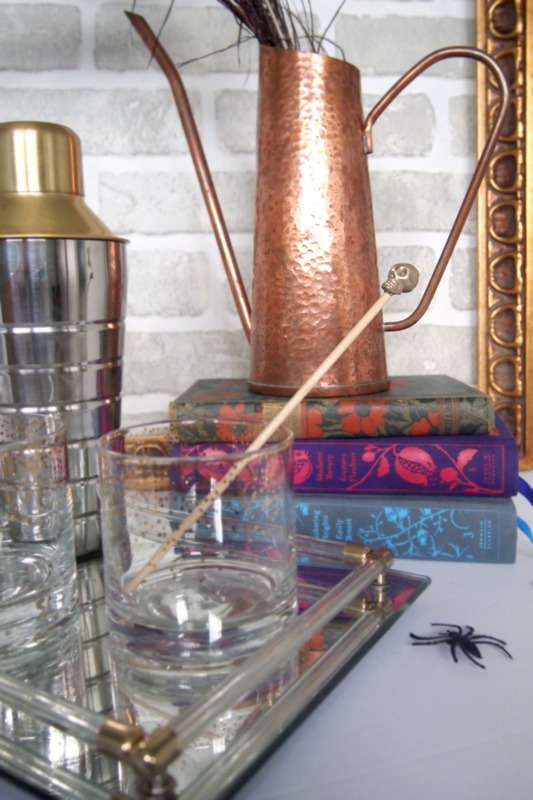 The wooden dowels are untreated wood and totally safe in your drinks, so you don’t have to worry. 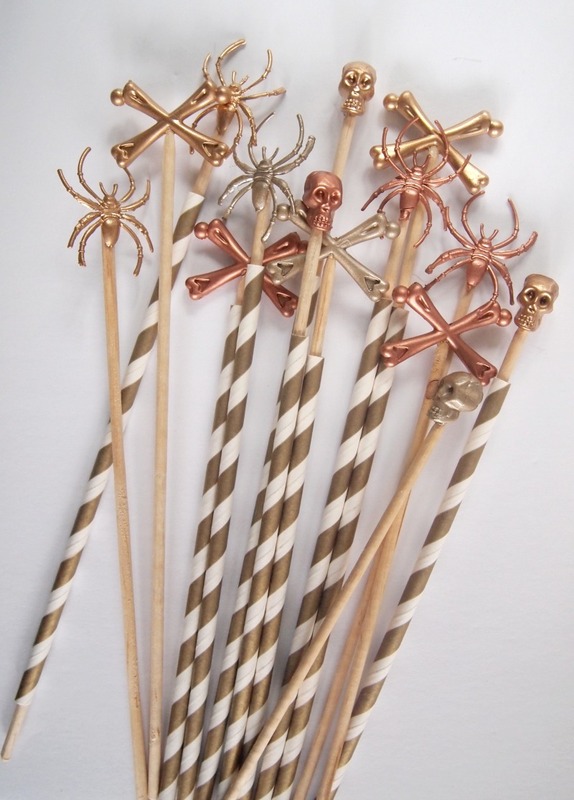 They’re also very neutral, so the creepy parts stand out rather than the sticks themselves. 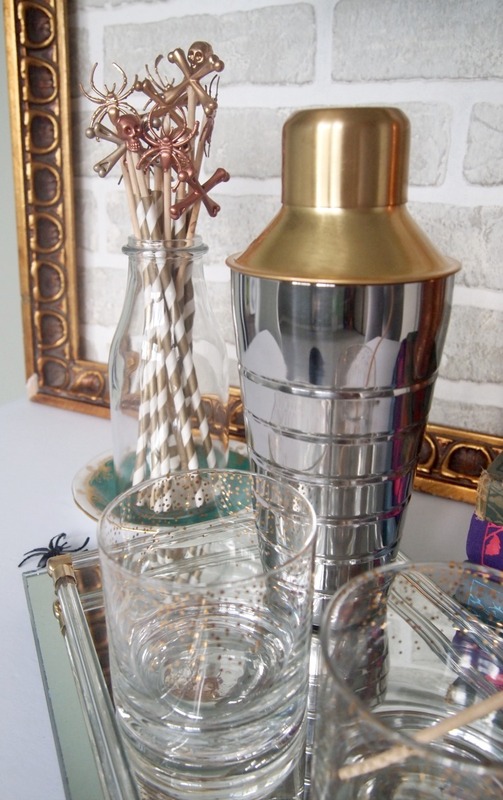 I love how this looks set up next to a bar with a few glasses, and the mixed metals are a great subtle way to make these chic and current. I made sure to mix in some other shiny things to make the stir sticks look like they belong, and not like they’re a weird accessory! 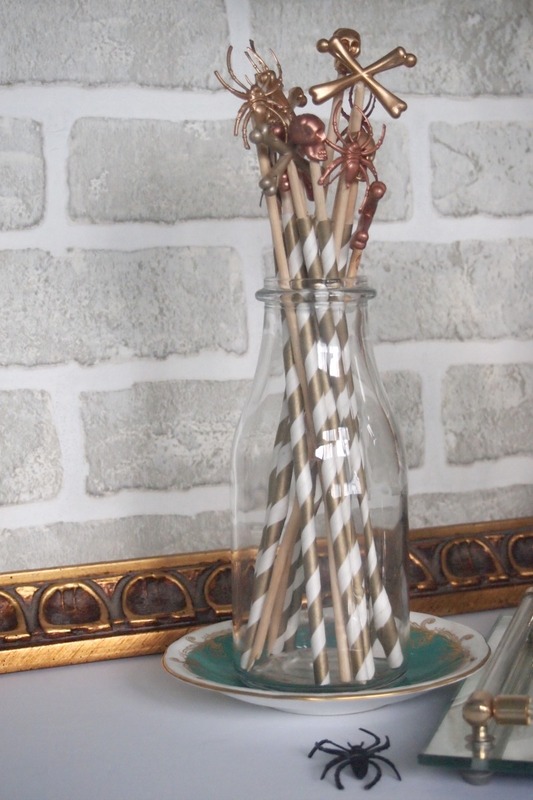 The white and gold striped straws are mixed in with the sticks for a little extra flair, plus it would be easy to grab both together for a drink – then you have your cute drink accessories all together! 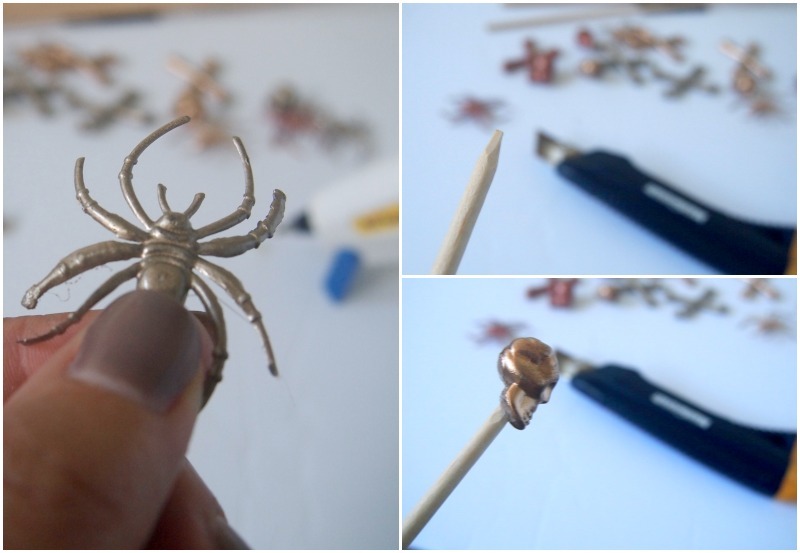 Some of the leftover creepy spiders were placed around as well, for an added fun Halloween look! Overall, I love that you have to look closely to see that the tops of the sticks aren’t quite… normal! Take a closer look at how they look on their own. 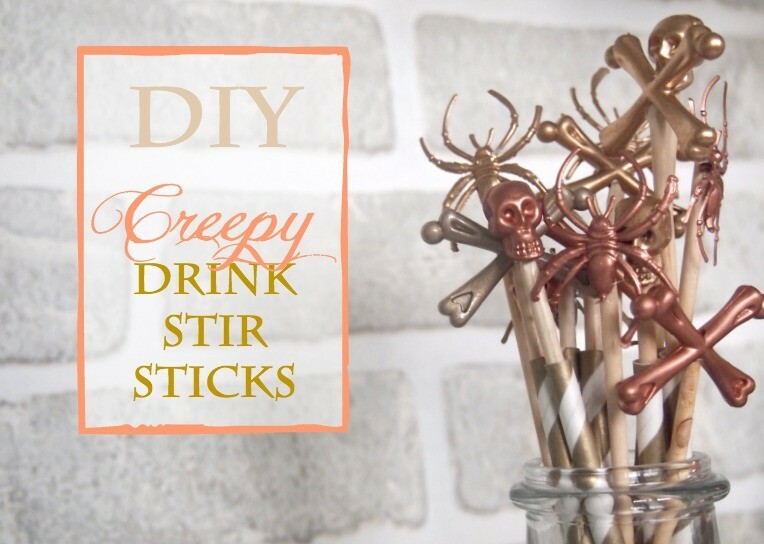 I think this is something that both adults and kids alike will love, and possibly even get a good giggle out of when they see the stirrers in their glasses! So what do you say? 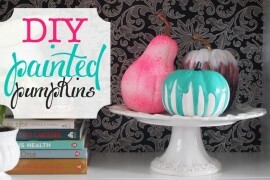 Is this a DIY you can get behind? 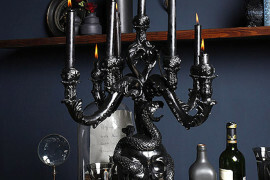 How cool would this be to bring to a host at a fabulous Halloween party, if you don’t happen to be hosting your own? All you need are a few creepy friends and about 30 minutes! Give it a shot!